Love the name Violet but want to make sure your daughter never shares her name with another girl? Try this exotic twist. Thanks to Sarah for suggesting Iolanthe as Name of the Day. Not so long ago, the only girl called Violet was one of the frightful children in the original Willy Wonka and the Chocolate Factory. Fast forward to 2008, and she’s a starbaby staple coming soon to a playground near you. From #904 in 1998 to #184 in 2008, Violets are in full bloom. Iolanthe may also derive from the Greek iole coupled with anthos – flower. 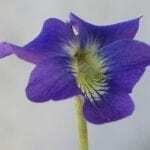 (Violet evolved from the Latin version of the word – viola.) Yolanda may also have come from the same roots. Yolanda, Yolande, Iolanda and Jolánta were around in the Middle Ages, and worn by royals and aristocrats throughout Europe. A thirteenth century poem celebrates Iolanda of Vianden, a national hero in Luxembourg. Rather than consent to an appropriate marriage, she became a nun – and a legend. Yolanda broke in the US Top 100 back in the 1960s. You can still find plenty of Jolantas in modern day Poland. But Iolanthe is quite rare. She’s never charted in the US, and she’s often attributed to Gilbert & Sullivan – wrongly. The comic opera Iolanthe, also known as The Peer and the Peri or sometimes Perola, debuted at the Savoy Theatre in London in 1882. It’s all about a fairy named – what else? – Iolanthe. Years ago, she was booted from Fairy Land for marrying a mortal. Now there’s a movement afoot to welcome her back, along with her half-mortal son. Much merriment, confusion and singing ensues. Iolanthe – or Iolanta – was also the title of a Tchaikovsky opera from 1892 – well after the Gilbert & Sullivan musical’s debut. But here’s the thing – Tchaikovsky’s source for the tale of Iolanta, a blind princess, was Henrik Hertz’s Kong Renés Datter – King René’s Daughter. Hertz was a Danish poet and playwright, and he scored a huge international hit with his 1845 play. This puts Iolanthe in use three decades prior to Gilbert & Sullivan’s fairy frolic/political commentary. And lest you think that only the Russians read the Danish poet, Henrik Hertz’ work was translated into most European languages – and certainly English. I’m most fond of #4, especially since it leads to the stargazer nickname Io, making your daugther’s name both botanical and astronomical. And, while I’ve not heard it in use, you could also opt for something like i-oh-LANTH. She’s so rare that few would correct you. Other than Io, nicknames are a bit tricky. Antha would work, and the old school Iola might be an option, too. Still, if you’re looking for a seldom-heard botanical name, Iolanthe is worth considering. You might also consider the more accessible Viola. But if you’re looking for a truly daring choice, Iolanthe is certainly distinctive. I love Iolanthe, and it’s one I’d seriously consider if my husband were to let me. Since my family is part Greek, it could be seen as more of a heritage choice than an insane choice. And i-o-LAN-thee is definitely my preferred pronunciation. It seems just the sort of thing to liven up a more traditional first name. Clara Iolanthe is a combo I’ve considered. On a related note, my husband has a cousin called Jolenta. While I admire her parents’ choice of an uncommon name, I can’t help but think that it sounds like “polenta” every time I hear it. By the way, I realised the other day that I’ve been contributing comments under both my real name, as seen above, and under my Internet appellation: AzhiaShalott. Oops! Congrats on Roseanna, btw. And I know exactly what you mean – we had one boy name. One. And no hopes of agreeing on a second! Thank goodness #2 was a girl. ‘Cause girls? We could name seven! I really like Iolanthe and I’ve been thinking about it for the past coupla months. It took my husband and I four years to come up with a girl’s name, and in the end we chose to name our daughter after my husband’s deceased mother, we were that stymied. Ever since Roseanna was born two months ago we’ve begun to worry about the next child, “What if it’s a girl too? !” Iolanthe is a name that I’ve been considering, but I’m worried it would sound too obscure and strange next to the well-known Roseanna. I like Iolanthe, but she won’t work with our last name and she’s a little too “weird” for DH. I did seriously consider another “violet” name for DD – Fiala is a Czech name meaning violet and I think it sounds fresh and less people would stumble over it than Iolanthe. I’ve never heard of Fiala – that’s really pretty! I like Iolanthe – I’ve also heard of the pronunciation yo-LAHN-thuh. I am particularly fond of all of the music and literary references. Whoever uses this name is serious about their theatre-going -talk about an opera buff! It probably has too many syllables for me (and my family would be tweaked out for years trying to figure it out) but I think it’s beautiful all the same. I want to like this name, its meaning, the possible nickname options, its literary references, but for some reason this name falls short of my radar. I don’t like the sound. I much prefer Violet, Viola or just plain Iole. Iolanthe is distinctive alright and pretty but she’s a bit flowery for me. Viola’s more my speed. And while I wholeheartedly would approve of someone else using Iolanthe for their daughter, I could never bring myself to use it. Such a gorgeous sound, a beautiful look and an awesome History. Simple Viola is my love. […] and the former royal palace in Honolulu is the ‘Iolani Palace.